The women’s cross-country skiathlon finish line. Photograph: Odd Andersen/AFP/Getty ImagesWhen I saw this photograph at first on The Guardian website, I thought there had been a terrible tragedy. 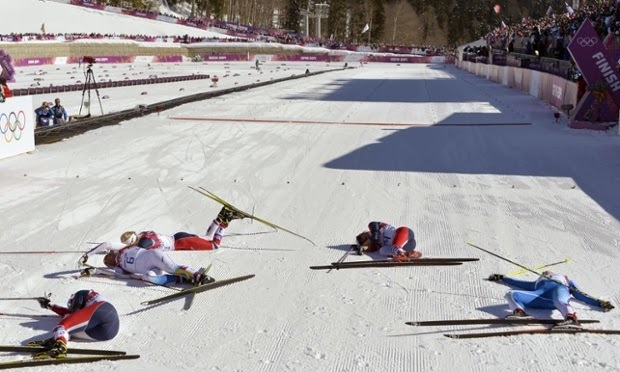 But no, it’s just the aftermath of the Cross-country skiathlon. It took a while to work out what that actually is – the Internet is awash at the moment with people who understand winter sports so the ‘Snow for Dummies’ sites have been pushed into the background. Considering how hard I’ve found it the few times I’ve just run in light snow, we will definitely be leaving this one to the experts.